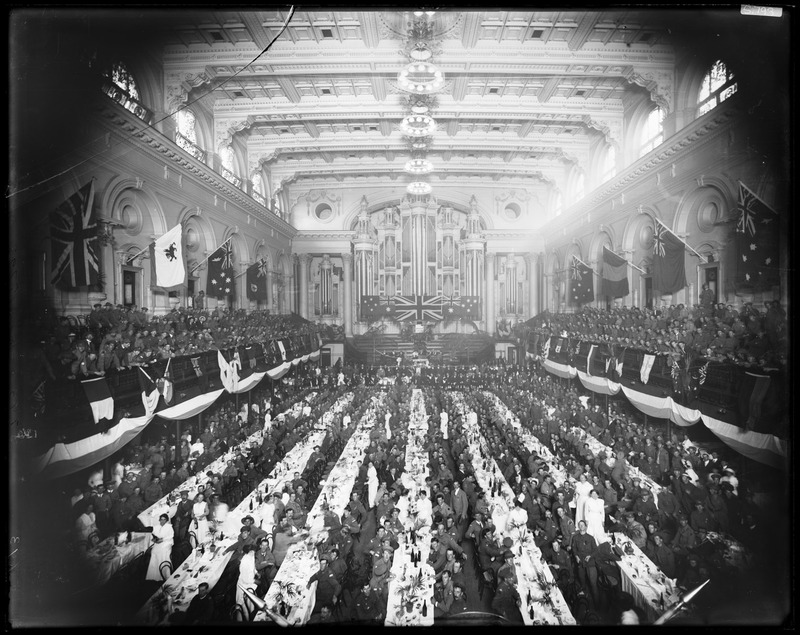 Returned soldiers dinner, Town Hall, Sydney, Anzac Day 1916. Image courtesy State Library of NSW. April 25 is officially declared as Anzac Day. Throughout the Commonwealth large crowds of people attend commemorative services to mark the first anniversary of the Gallipoli landing. In Sydney up to 100,000 people attend a memorial service in the Sydney Domain. 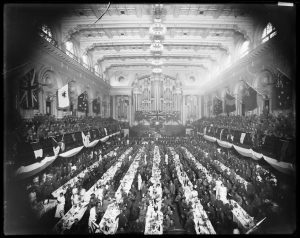 Returned soldiers are guests of honour at a dinner held at the Town Hall. Reveille 5 a.m. Anniversary of Gallipoli landing. On parade 6 a.m., orders, roll call and gargle. Ribbons given out for day by divisional orders to those entitled. Red for landing, blue for campaign. I received both. Could not attend Memorial Service at 6.30 a.m. Very sorry. Very hot day again. On duty 2 p.m., dressings, foments, med. etc., tea for patients 5 p.m. Old members of corps held dinner in honor of day, at 6.30 p.m. Old officers present, splendid dinner, very nice evening, toasts, speeches etc. O.C. said would be leaving for France within 2 weeks. Closed 10 p.m., lights out 10.15. To rush the dawn which gave us Anzac Day. For in their splendid youth they knew not fear. Immortal heroes of Australia’s Anzac Day. This entry was posted on April 25th, 2016.